A generous and meaningful gift from the Halaby-Ammar family & Cycle Bar Windermere. On Friday, September 21, 2018, the Halaby-Ammar family gathered once again on Unit 43. They gathered in memory of Loma Halaby-Ammar to present a cheque to the Grey Nun's Hospital, with the dollars specifically going to the Palliative care unit (Unit 43). The family generously donated $60,300 which they raised through a fundraiser organized by Cycle Bar Windermere. 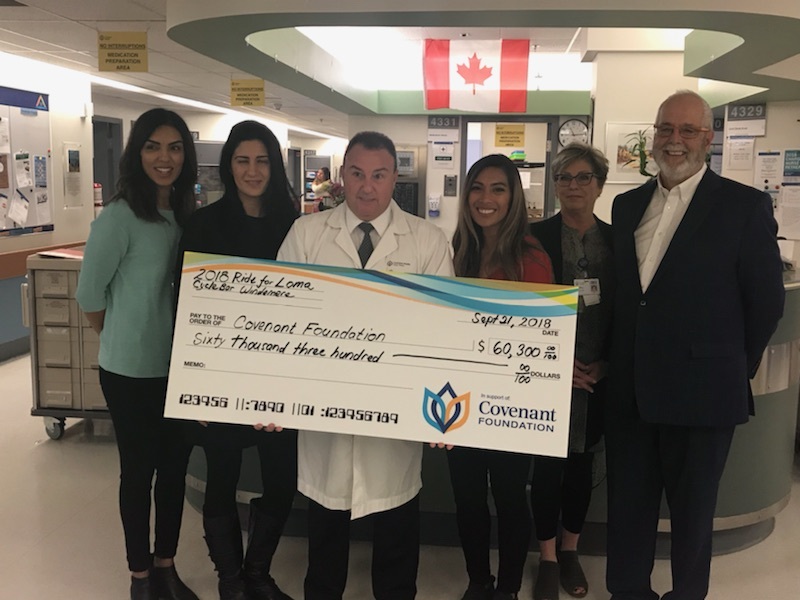 Left to right: Loma's close friend and organizer of the Ride for Loma, Farha Shariff, Loma's younger sister, Maya Jaber, Loma's Palliative care doctor, Dr. Amigo, close friend, Melba Robb, Covenant Foundation Chair, Ron Gilbertson. The 2018 Ride for Loma will be an annual fundraiser and a beacon of light for those who have lost loved ones; allowing them to gather and support one another. Look out for 2019 event news.